Discussion in 'Mapping Questions & Discussion' started by WombatSauce, Mar 3, 2016. 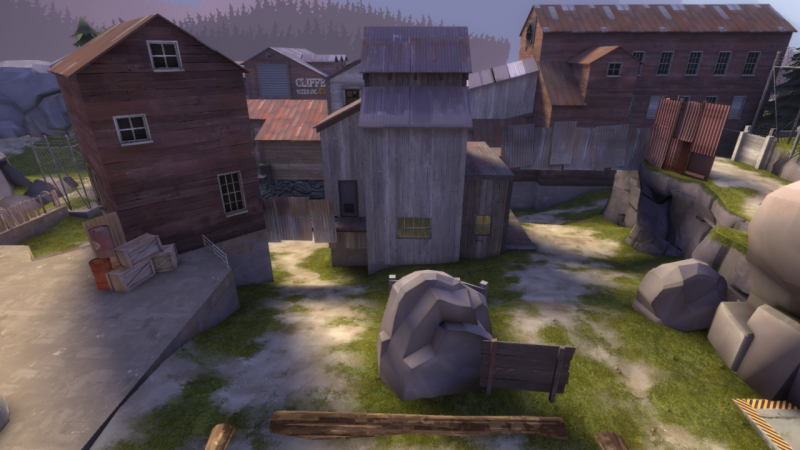 Hi, I've been working on my first map, cp_urban_legend, for a little while now, and I'm starting to think about real textures. I know pretty much what I'm gonna use everywhere except for mid tower (refer to thread in my signature for images), and I want to make it a grey mann co. building, with the grey mann co. overlay on it. What texture(s) should I use for it? Also, what is the grey mann co. overlay called? I can't find it. Well, city buildings tend to have brick and concrete walls, so I would recommend those. Use those search terms in the texture browser until you find something you like. You can narrow down your search further, for example, to red-team concrete walls by typing "red; concrete; wall" in the filter box. You can search through overlays by throwing in "overlays" in your search term; they're all under the same path. If I look at your map I think it's better if you keep texturing to a minimum, at least before you have it properly tested. From the screenshots of your map I can already tell it's very dark, and the ghost spot lights don't help with that. Try to get the map tested thoroughly before detailing, as it will safe you from having to remove your detailing due to layout changes. Try to get the map tested thoroughly before detailing, as it will safe you from having to remove your detailing due to layout changes. Textures hardly hinder layout changes at all. Wooly Socks, don't be afraid to use textures in early versions of your map. What you should stay away from, though, are extensive prop use and tiny details like door frames and support beams, stuff like that. Those make layout changes tedious. I find that textures doesn't impede layout changes as much as they do testing. It's a psychological thing. I forgot to mention that I'm doing soho/ king theme. What should I use for that? Then just try different textures until you find one you like. You may have to shift the texture in the texture application/face edit sheet if they don't line up properly. From my first reply, I'd go with brick or concrete since your map is city themed. There are a lot to choose from, but ultimately it's your choice and what looks good with the rest of your textures. Ok, so concrete/brick still looks good w/ the soho theme? It's actually really bright in game, the map just looks back in the pictures. I have a quick question. What's the nice grass/ground blend texture that I always see on most pro versions of maps? As in Pro Viaduct, Swiftwater, etc. I really like it and would like to use it in another map, so I would like to know what it is. Edit: If this question was too vague here's a picture. The texture used on all the displacements.